Advanced nutrition made simple. 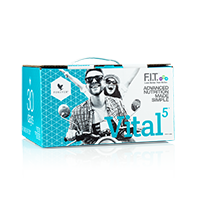 Vital5® combines five amazing Forever products that work together to bridge nutritional gaps and provide key nutrients your body needs to help you look better and feel better. The products in Vital 5 were specially formulated to work together synergistically to build a road to good health. The series of systems in your body are like roads on a map and at Forever, we call this the Nutrient Superhighway. With Vital 5, you can learn how to support every road in the Nutrient Superhighway with an easy-to-follow supplement schedule. (4) Forever Aloe Peaches®, (1) Forever Daily®, (1) Forever Pro-B®, (1) Forever Arctic Sea® and (1) ARGI+® pouch.